My name is Andrew Joyce and I write books for a living. 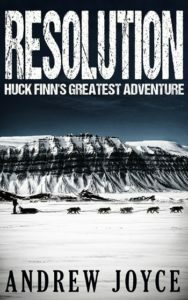 Cécile has been kind enough to allow me a little space on her blog to promote my new novel Resolution: Huck Finn’s Greatest Adventure. I think it’s a good book, but what do I know? Anyway, I’m kinda shy about tooting my own horn. 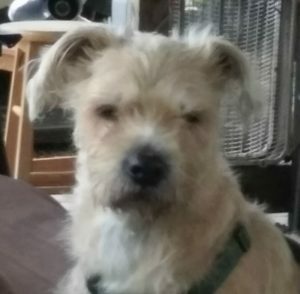 So I think I’ll turn things over to my dog Danny—Danny the Dog. He always has an attitude and usually does not speak highly of me. But please understand that we co-exist as the old Soviet Union and the United States once co-existed. We tolerate each other. So without further ado, here’s Danny. Howdy, folks. It’s me, Danny the Dog. I live on a boat with my human, Andrew. Today, I’m here to speak about outrageous fortune and the outrageous fortune of which I speak is the insidious leash he makes me wear. I mean . . . really . . . just because I’ve run away a few times, he thinks I can’t be trusted. I’m a big boy—I’m ten years old! I can go out catting (excuse the expression) around at night and still make my way home all by myself. So here’s my problem. Andrew doesn’t use a regular leash like any sane person would. No, he’s gotta use a line from the boat . . . a twenty-foot-long line, or rope to you landlubbers out there. It’s downright demeaning. The other night we went to a local biker bar. Andrew doesn’t like going there because he’s a sissy and he thinks the bikers will beat him up, but I bring him anyway. I love the place because the biker girls always crowd around me and pet me and tell me how cute I am. I know that, but it’s always nice to hear. Especially when it comes from women with multiple tattoos claiming they are the property of Big Bear or Grunge or whomever. It makes me feel special. So there we are, Andrew is sitting by himself—naturally. And I’m the star of the show with the females of the pack—naturally. Now, because Andrew does not trust me, he has me tied to a post (it’s an outdoor bar). It was then that it happened. One of the girls felt sorry for me and unclasped the leash. Well, partners, I took off like a bat outta you-know-where, but I didn’t go far. I just wanted to teach Andrew a lesson. To cut my story short, I miscalculated. I thought if I made Andrew look for me and then showed up on my own, he would forego the leash. But it didn’t work out that way. Now I find myself indoors 24/7, unless I’m taking Andrew for a walk. And then, of course, I’m on the damn leash! This is Andrew again. On behalf of Danny and myself, I would like to thank Cécile for having us over. It’s been a real pleasure.